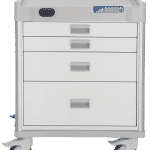 Anesthesia carts are designed to store all necessary tools in a single, compact portable location with a locking system designed to keep unauthorized personnel out. The blue color makes cart identification easy. 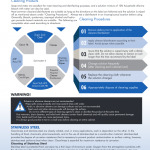 Emergency carts are designed for high pressure situations. The two primary features include the signature red color and a breakaway lock system. The red color ensures the cart is found easily, and an unbroken breakaway lock tells staff the cart is fully stocked. 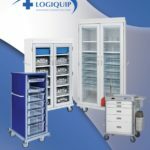 Using a wide assortment of accessories, these carts have the right product for any emergency situations. 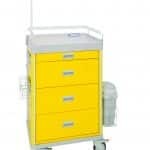 Isolation carts are a convenient way to store PPE in an easy-access location. The bright yellow color is a constant reminder to staff and visitors to use proper PPE and precautions when entering a patient room. 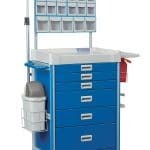 Our Standard QT® Cart comes in multiple sizes and can be equipped with a key lock, electronic lock, or proximity lock. 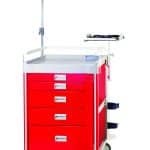 These general use carts are great for storing products in all patient areas.